One of the most frequently searched for topics which lands people on this blog is "teacup planter" in regard to a post showing a pretty plant on my front porch in a WalMart teacup planter. Well, here we go again! This time I am sharing my Christmas holly design ceramic teacup planter from WalMart on my porch with a silk poinsettia. The second most searched for topic, especially at this time of the year is "Friendship Tea Recipe." It is a beverage I remember from my childhood, but since beoming acquainted with loose leaf tea and tea blends, I no longer care for the taste of it. However, I keep it posted on the sidebar here for the many people who expect to find the recipe on a blog with the title of "Friendship Tea." For those of you looking for the recipe, enjoy! 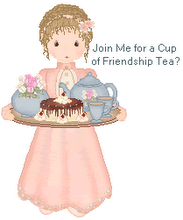 I really like your Teacup Planter and the Friendship Tea. A very pretty planter. It is fun to see what draws people in to a blog. That is a lovely teacup planter - perfect with the poinsettia.